The Shadow Giller jury is continuing to work its way through this year’s shortlist. 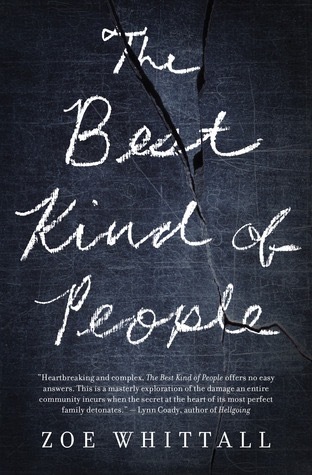 Naomi, from Consumed by Ink, has read Zoe Whittall’s The Best Kind of People, which she describes as “timely, insightful, and a page-turner”. Naomi goes on to say that while the subject matter is heavy, Whittall writes it in such a way that it “feels effortless and conversational. She even throws in some humour to lighten things up”. The Giller Prize does it again: The Beggar’s Garden (2011) is another excellent short story collection, and another from a debut author. 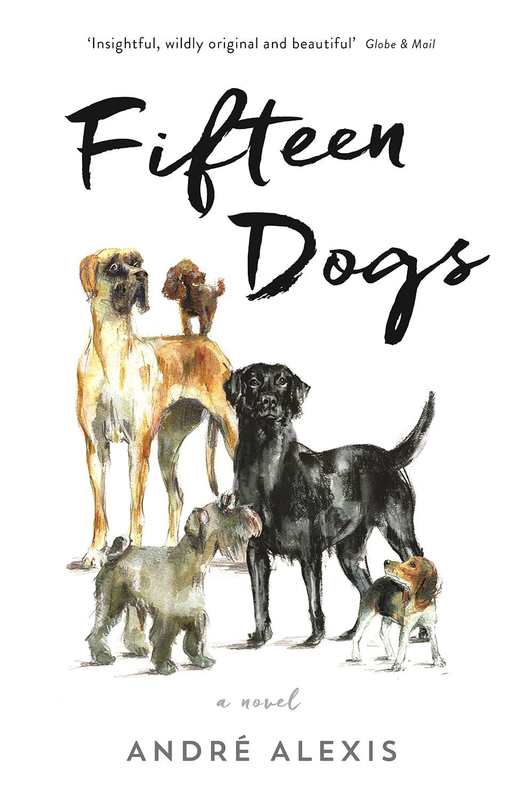 The author’s blurb says that Michael Christie “worked in a homeless shelter in Vancouver’s Downtown Eastside and provided outreach to the severely mentally ill.” His experiences there have made there way into this collection with striking emotion and clarity. Canadian author Patrick deWitt’s The Sisters Brothers has been shortlisted for this year’s Booker Prize and longlisted for this year’s Giller Prize. 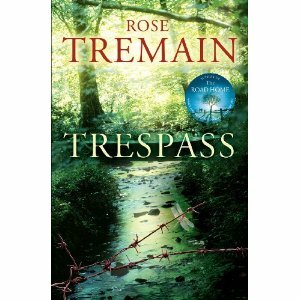 It is the kind of book that could best be described as an enjoyable romp. It’s billed as a Western, but I saw it more as a road story — with guns and horses. Set during the California gold rush of the 1850s, it is narrated by Eli Sister, one half of the Sisters brothers of the title, who makes his living as an assassin. But Eli is not your average killer for hire — he has a sensitive side, troubled by his weight, worried he’ll never find a woman to settle down with and constantly dreaming of a different life, perhaps running a trading post “just as long as everything was restful and easy and completely different from my present position in the world”. His elder brother Charlie is more what one would imagine as a typical killer — he is ruthless, is attracted to violence and doesn’t suffer fools. But he’s also an alcoholic and his love of brandy means he spends a lot of his time on the road nursing horrendous hangovers. All three Shadow Giller bloggers have now reviewed The Sisters Brothers (which is shortlisted for the Booker Prize, in addition to its Giller longlisting). Trevor’s review is here, KfC’s here. And internationally, Guy Savage who chose A Cold Night for Alligators. I have email addresses for all the winners and will send you a message to get postal details. My thanks to everyone who entered and to Random House Canada for providing copies for the Canadian contests. We will try to do this again next year. I will be in touch with all winners via email to obtain shipping addresses. 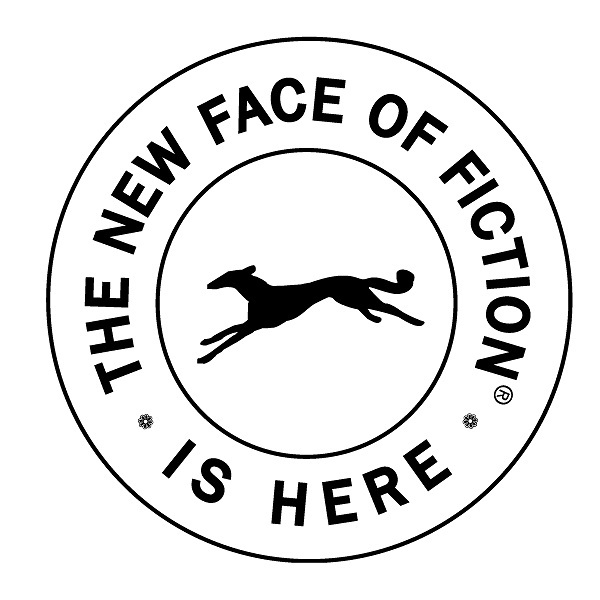 My sincere thanks to Random House Canada who are providing the books (and shipping) for Contests 1 and 2 — I am delighted to be underwriting the costs for Contest 3 as part of my objective of promoting Canadian writers to readers outside the country. Canadian entrants — move on to the next post for an excellent Giller Prize contest that gives you a chance to win autographed copies of all five shortlisted books. International entrants — stay tuned. Mrs. KfC has agreed to underwrite a Giller contest that will include an international section. You will need to pay attention to Shadow Jury thoughts, I warn in advance. September 9 to 16 marks the beginning of the semi-annual ritual known as “Fashion Week”. In fact, it is four weeks of fashion shows beginning in New York, moving on to London, then Milan and finishing in Paris, home of haute couture. The first runway show was presented by Charles Worth in Paris in 1858 and this year there will be about 275 runway shows in the four cities. The most lavish of them can cost up to $300,000 to stage, which is a lot for just 45 minutes of show. But the stakes are enormous. Fashion is a multi-billion dollar industry and neither longevity nor innovation can guarantee success, as both Christian Lacroix and Isaac Mizrahi learned when their fashion houses went bankrupt. Coco Chanel said “Fashion you see, goes out of fashion; style, never”. There are six style icons whose innovation and vision informed fashion and design over the last hundred years and they have had enduring influence on the both the art and the business of the fashion industry. Coco Chanel, Madeleine Vionnet and Elsa Schaparelli were contemporaries: three brilliant independent women, running businesses themselves in an era when women certainly did not work, let alone run large enterprises. The fact that the three of them were working in the same industry – creating the industry, actually – at the same time probably made them all better at their work. Each brought something unique to the game and their work is widely copied to this day. 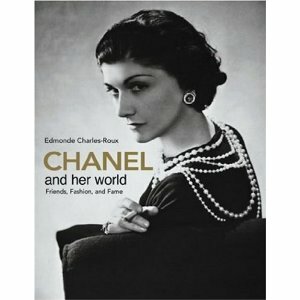 Chanel and Her World by Edmonde Charles-Roux (Vendome Press) is the best of the plethora of Chanel books on the market. This book was out of print for twenty years and has just been revised, updated and re-issued. A beautiful volume that explores both Chanel’s style and her fascinating life, the book has over 600 illustrations from Chanel’s early days as a milliner to the design of the iconic Chanel jacket when she was at her peak of creativity. Coco Chanel liberated women from the strictures of Victorian fashion, eliminating stifling corsets, creating comfortably loose, yet feminine, clothes, bobbing her hair and even wearing trousers, which were an instant hit with women, if not with the men of the day. She is credited with inventing sportswear for women, including the bathing suit and beach pyjamas. By 1916, a few short years after the opening of her first salon, she had 300 employees. Never content with the status quo, in 1920 she branched out and created Chanel #5, to this day the best selling perfume in the world. In 1936, she invented the little black dress, many versions of which are captured in this book. Although she retired and lived in exile in Switzerland during World War II, she staged a dazzling comeback in 1954, at age 71, and created some of her most beautiful work. In addition to photographs and illustrations of her clothes, there are many photographs of her salon and her homes, all of which round out the picture of this fascinating woman. Madeleine Vionnet was born in France in 1876 and left school at age 11 to become a seamstress. By 1912 she had opened her own haute couture establishment and began a remarkable career that has had echoes in the design of beautiful clothes since that time. 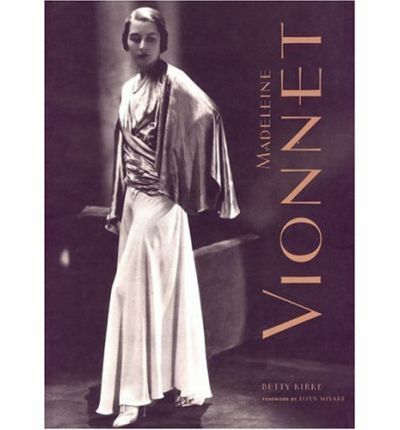 Madeleine Vionnet by Betty Kirke (Chronicle Books) is a must read for anyone seriously interested in the technical underpinnings of fashion design. Through her studies of the figures on classical Greek vases in the Louvre, Madeleine Vionnet pioneered the use of the bias cut in garments. This was a breakthrough event in the history of fashion, as bias cut designs are very flattering on womens’ bodies, and enabled the creative use of many new fabrics which had emerged after the First World War. Betty Kirke’s book is unique in the fashion world, as it has not only the photographs of the gorgeous clothes, but also the exact patterns of how to cut them. The geometry of fashion was Vionnet’s specialty, but she was also a pioneering employer. She had a large staff of seamstresses and provided them with free medical and dental benefits through the staff doctor and dentist. She gave paid vacations, was the first salon to give her employees coffee breaks, and granted maternity leave to the women who worked for her. If one of her seamstresses or vendeuses got married while in her employ, she was entitled to make herself a wedding dress from last years’ designs. Shocking! The Art and Fashion of Elsa Schiaparelli by Dilys E. Blum (Yale University Press) is a gorgeous record of the work of the third of these three remarkable women. 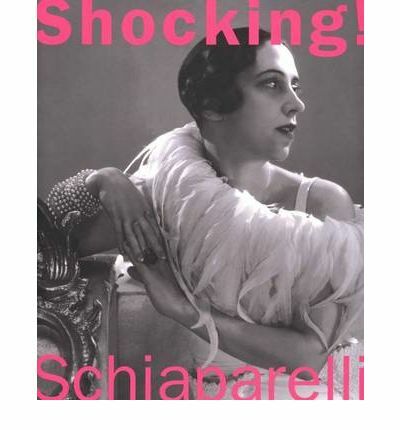 “Shocking” in the title refers to Schiaperelli’s signature color, shocking pink, which was not considered appropriate for fashionable garments until she began to use it liberally. The 300 reproductions in this book cover her entire career, starting with her early work as a sweater designer, focused on designs with tromp l’oeil effects. Schiaperelli was the first designer to understand the value of mass producing her designs and entered into agreements with select department stores to market her clothes to the everyday shopper in New York and London, rather than catering to the limited world of haute couture clients. She also formed strategic alliances with textile manufacturers to further her plan of mass producing her wide array of sporting clothes. Schiaparelli began innovating with fasteners on her clothes, incorporating zippers and hooks as elements of design, rather than just utility instruments to be hidden in the garment. As her clothes became more popular, she opened a lavish new salon in Paris in 1935. Understanding the value of publicity, she had the press clippings from the opening printed on cotton and silk fabrics and incorporated them in to her collections for her entire career. While other designers of the day concentrated on Paris or Rome, Schiaparelli travelled extensively in the USA promoting her brand, and worked in London, as well as Paris and Rome to create new markets. She designed clothes for movies and associated freely with the surrealists in Paris, often incorporating their ideas in to her designs. Her motto was “ made beauty beats born beauty”, a reference to the fact that every woman’s beauty can be enhanced through beautiful garments. And now to the men. The three most influential designers of the last fifty years were Dior, Yves St Laurent and Valentino. 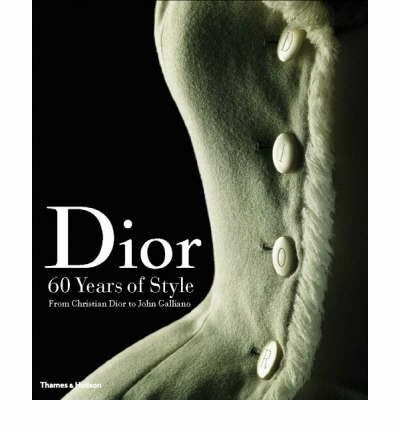 Dior : 60 years of Style by Farid Chenoune and Laziz Hamani (Thames & Hudson Ltd.) chronicles the work of the house of Dior from its explosive beginnings in 1947 to today. The 250 illustrations and photographs are a beautiful record of the last 60 years of beautiful designs. Christian Dior dazzled the fashion world in the spring of 1947 when he produced what has become known as The New Look. For the first time since the war broke out, he created a dramatic new silhouette. Gone were the skimpy dresses, short skirts and structured shoulders in vogue in wartime because of the scarcity of fabric for civilian uses. His bold new designs had nipped in waists, soft shoulders and full longer skirts — femininity reasserted. His show was wildly successful and, in an instant, most of the clothes on the market were passé. Stores scrambled to keep up with the demand for his lovely new look and other designers sharpened their pencils and came on board with this innovation. Ten days after his show, his salon had exceeded their profits targets for the year and it was only February! Success followed success and by the mid 1950’s Dior ateliers produced 12,000 dresses annually. He dressed movie stars and royalty and his name became synonymous with chic. He collaborated with Roger Vivier to make shoes for his collections and launched Miss Dior perfume to capitalize on the value of his name. Christian Dior died suddenly in 1958 and his house was presided over in turn by Yves St Laurent, Marc Bohan, Gianfranco Ferre and John Galliano, who runs it today. This 383 page book details the successes of the House of Dior and presents a beautiful visual history of the evolution of fashion from 1947 to today. If Coco Chanel started the liberation of womens’ fashion, Yves St Laurent finished it. He invented “le tuxedo” for women, “le smoking jacket”, popularized the well-tailored pant suit, and created the safari jacket, the trench coat and the peacoat, all of which endure to today. 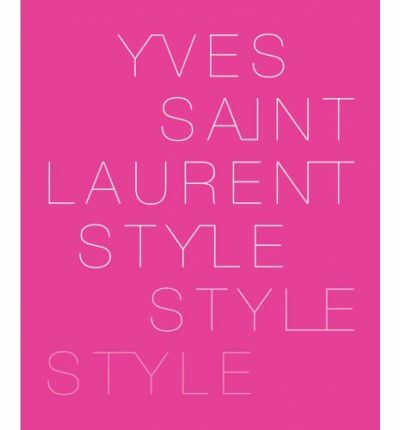 His entire oeuvre is beautifully captured in Yves St Laurent Style published by his former life and business partner, Pierre Berge, and the Fondation Yves St Laurent (Harry N. Abrams, Inc.). It is the catalogue of the posthumous show of his works in Paris and includes over 300 photographs of his work at the back of the book, in addition to lush full page photos of some of his most important pieces, curated by color and by era. St Laurent’s interest in design began when he was a toddler and accelerated as he matured. He was influenced by three designers: Chanel, Vionnet and Schiaperelli. As a young boy growing up in Algeria, he amused himself by creating entire collections, and when he was a teenager he came to the attention of Dior when he won a design competition for a black dress sponsored by the Paris fashion institute. He was hired by Dior when he was in his late teens and though he was untrained his genius was apparent even then. When Dior died suddenly, St Laurent took over the famed house at age 21. He produced another revolution at the House of Dior in 1958 with the new “A-line silhouette”, the famous Trapeze dresses of the swinging sixties. In 1961 he was called up for military service and fell in to one of the deep depressions which would plague him all his life. When Dior announced that they had hired a replacement for him, he and Pierre Berge started their own house and success came very quickly. By 1965, he read the winds of change in the air and started his “Rive Gauche” line, adding ready-to-wear to his couture business. The democratization of fashion resonated with the hipsters of the sixties and his designs for both Rive Gauche and his couture house reflected the spirit of the new generation. At the height of his success, he dressed Princess Diana, his lifelong muse Catherine Deneuve, Princess Grace, Audrey Hepburn and countless other icons of fashion. Valentino Garavani was the most successful couturier of the 20th century. His house endured for 50 years and was the last couture establishment to be controlled by the designer when he retired in 2008. 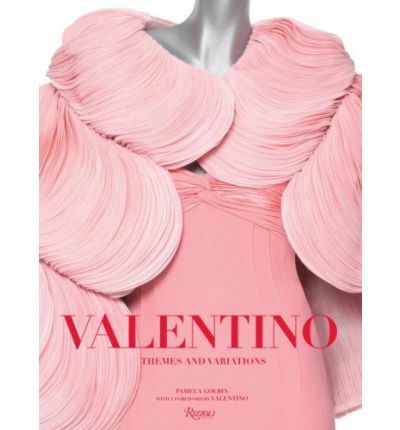 Valentino: Themes and Variations by Pamela Golbin(Rizzoli International Publications) is 300 pages of photographs of his work from 1957 to 2008. There is scant text, but his work speaks for itself, and reading this luxe volume gives a rich history of the evolution of classically designed clothes almost all of which still represent high fashion today. While he started his house in Rome, Valentine regularly went to Paris to present his couture lines, a risky proposition for an Italian going to fashion mecca. The strength of his work earned him great respect in France, culminating in his receipt of the Legion d’Honneur in 2007. Valentino’s genius was in both design and embellishment, and the close-ups of the embroidery in this volume alone make it worth the price of the book. The last section of the book includes Valentino’s print advertising campaigns from the 1960’s to 2008 and is an interesting reflection of how he positioned his work with chic women internationally. Jackie Kennedy was a regular client of Valentino’s and the pink suit she was wearing when her husband was assasinated was his design. In happier times, she wore a piece from his all white collection when she married Aristotle Onasis on Corfu. When all is said and done at the end of Fashion Weeks in late September, when close to 10,000 garments have paraded down the runways, some will have been beautiful, some outrageous, some revolutionary, and some shocking, but the ones that will succeed will be those that define style. As Coco Chanel said “Fashion you see, goes out of fashion, style never”. 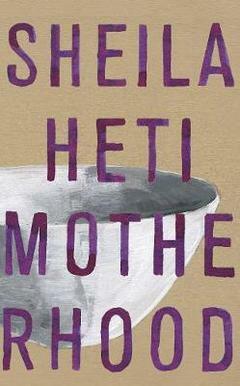 The 2010 Man Booker Prize longlist was released today. Last year, KfC managed to review all 13 titles and I will set that goal again this year, although I may fall a couple short as I have only read four of the books. I will post a category in the sidebar with updates and links to reviews as they go up. 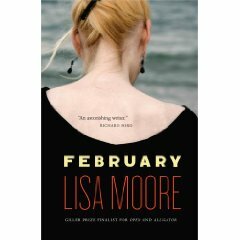 February, by Lisa Moore — reviewed here — one of two Canadian entries on the list and a major surprise. (Emma Donoghue’s Room — not yet released — is the other.) 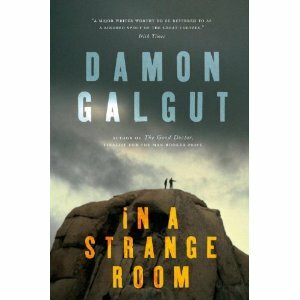 February did not even make last year’s Giller Prize longlist. 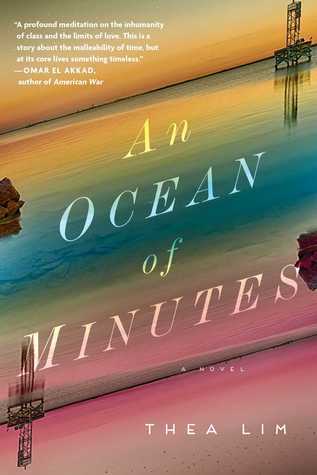 But…it is very topical, since it is about the Ocean Ranger disaster and the current Gulf of Mexico crisis makes it very timely. After a few years of Canadian absence from the Booker list, it is nice to see two there but I am sure Yann Martel, Linden McIntyre and Tom Rachman (all eligible Canadian authors) are as surprised as I am that at the choices. 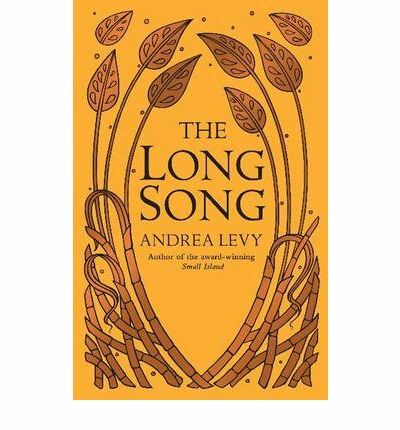 The Long Song, by Andrea Levy — reviewed here. Well-loved for Small Island, Levy again returns to Jamaica with this novel about the final days of slavery — and what happens when it ended. For my money, a worthy inclusion on the longlist. Levy’s approach to her very serious subject is to examine it through the eyes of some individuals effected by it, both black and white. What results is a very human, readable novel. 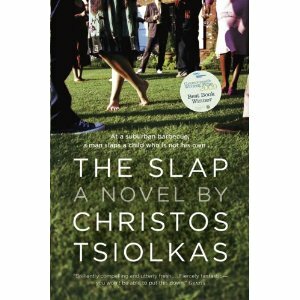 The Slap by Christos Tsiolkas — reviewed here. 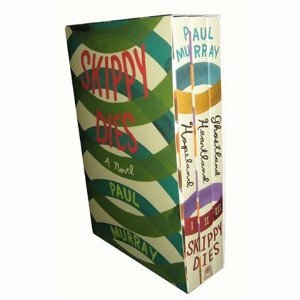 An Australian novel, this one has been around for a while — short listed for their Miles Franklin prize in 2008, it won the Commonwealth Writers’ Prize in 2009, but was only published in the UK this year, making it Booker eligible. A very interesting study of modern Australia, told through the eyes and experiences of a dozen characters who happened to be present when “the slap” took place. For Canadian readers in particular, a worthwhile look at contemporary life in one of the other Old Dominions, with many parallels to our own experience. 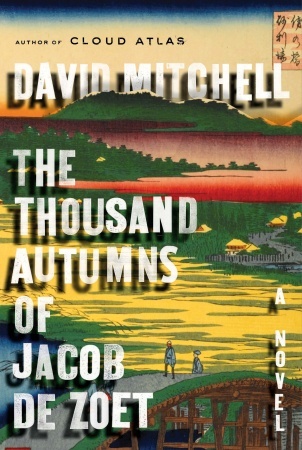 The Thousand Autumns of Jacob De Zoet by David Mitchell. 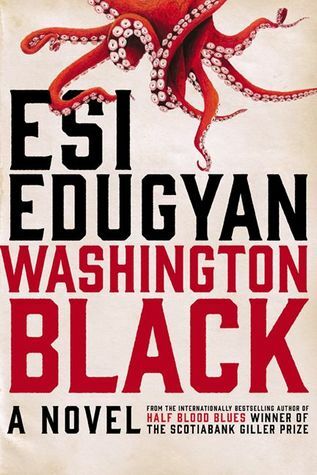 When the bookies post their odds, I expect this to be one of the favorites — it has received very good reviews and been the subject of much talk. I’ll offer a bit of a preview, however. Despite being a major David Mitchell fan (I have read all his books), I will be out of step on this book — indeed, of the four that I have read so far, I would rank it third. Then again, as veteran visitors here may remember, I did not much like last year’s Booker winner, Wolf Hall, either. Which gives us the KfC reading list for the next while — copies of these have been ordered, with review timing likely dependent on when they arrive (a number are not yet available in North America and have to be shipped from the UK). I won’t promise that I will get to them all but I’ll do my best. 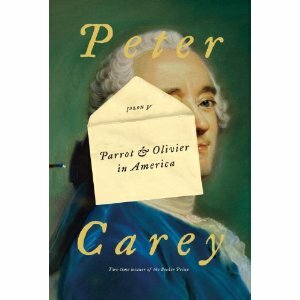 Parrot and Olivier in America by Peter Carey (already a two-time Booker winner).